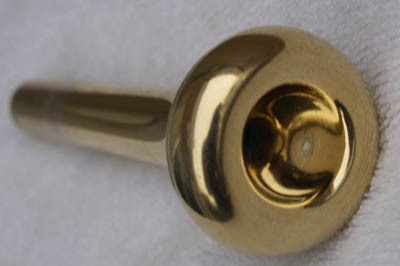 Gold-Tone mouthpieces are known to have existed for cornet, trumpet and trombone. Below is table indicating which number - instrument combinations are known to have existed. Gold-Tone mouthpieces are very rare. I have found a picture of Benny Carter holding a Conn trumpet (recognizable by the straight braces, looks like probably a 22B) with a Gold-Tone mouthpiece, and Henry Wells playing trombone with a Gold-Tone mouthpiece. These pictures show a Gold-Tone 22 trumpet mouthpiece from different angles.